We rode our Bicycles into Reno from Sparks which was only a couple of miles away. We had to detour a bit not knowing how to get over the railway lines and interstate 5. 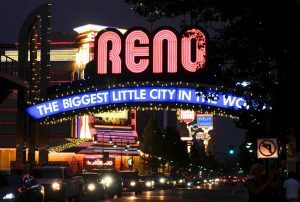 Reno was named after Jesse L Reno a Union General in the Civil war. 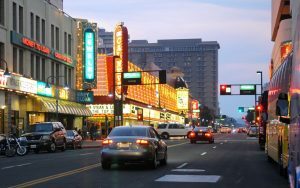 It’s known as the biggest little city and in the mid 19th century was bigger than Las Vegas as there was gold and silver found nearby and later the railway was laid through Reno. In the 1930’s Reno boomed because it was one of a few places where couples could get divorced! 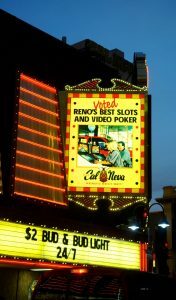 Reno is high desert at 4500 ft, at the foot of the Sierra Nevada mountains. It’s in a fertile area called Truckee Meadows and gets its water from there. There is nothing natural about Reno, it’s all man made infrastructure in the desert. The water is piped in from Truckee meadows. The heart of Reno city doesn’t appear to be very big. 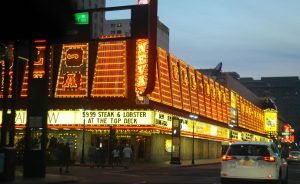 As we rode around we saw the casino’s and the advertising that entices you in for cheap meals. We had heard and read online that RV’s can park in the carparks of casinos for free, sometimes with a hookup (power and water) for free. 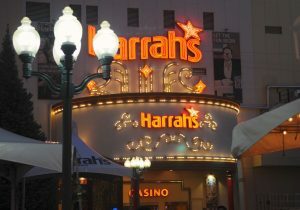 It’s assumed you will go into the casino and lose your money! We didn’t see any nice RV’s parked in casino car parks today and the RV park we are in (which is very nice) is pretty much full, so I’m wondering how much of this free parking is just myth and rumour. There is art scattered around the city and the river runs through it so it’s pretty. We thought we would have lunch in a casino and see what they are all about but when we were in the city, we couldn’t muster up the enthusiasm to go in, so we ended up having a burger and fries lunch in an outdoor restaurant by the river, which was very nice. It’s 29 deg in Reno today but with a strong wind blowing, so it’s a very nice temperature. On our cycle back, we followed the cycle path that leads along the river, under various bridges and the interstate. On this short ride we saw many homeless people of all ages-more than we have probably seen in other city’s. Many of them totally comatose. Those that were conscious seemed friendly enough but seeing so many homeless living under cardboard suspended between shopping trollies is just plain upsetting. Some of these makeshift beds have a wheelchair at the side. These are all people that fell through the cracks at some stage of their lives-disability, mental illness, abuse etc. I guess if you are homeless Reno is a great temperature for sleeping under the stars in the summer, but this place becomes a ski destination in the winter, where do the homeless go then, and how do they stay warm? This is an aspect of the US I can’t get used to, and hope I will never find it OK, or normal. I can see why immigrants try to get to Europe, NZ, Aust where they will get a benefit and a chance. There is a benefit program here called SNAP (Supplemental Nutrition Assistance Program) but it doesn’t seem to be helping these people. 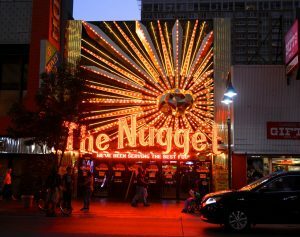 That evening we drove into Reno to see it by night. It was a very lively city, lots going on-music, dancing, lots of people around. S took some photos and I drove us home again. We had a full day the next day in Reno but needed to get some things done. I went off and did some grocery shopping and then cooked 16 meals (32 portions) from 4 different recipes. I do these cook ups every now and then, about once a month, then I don’t have to cook each night-just get something out of the freezer and make a salad. This shopping and cooking took just about all day. Stuart kept busy with a few small maintenance issues, laundry etc. A relaxing day. 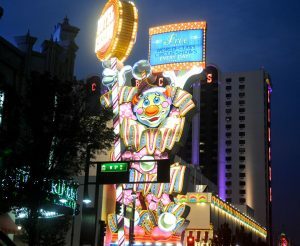 On the road tomorrow for Elko, a town in the middle of the Nevada Desert.